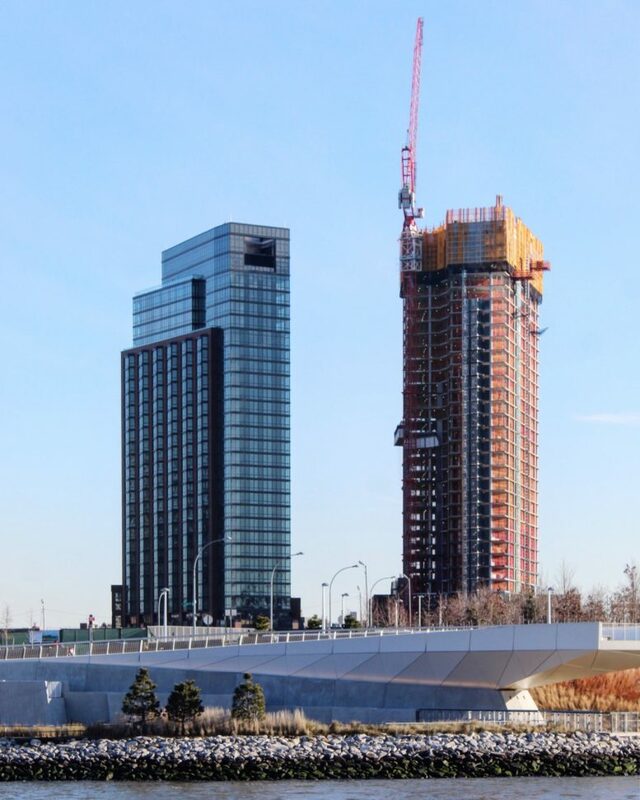 The second tower at Greenpoint Landing is on its way to topping off sometime this spring. Addressed at 41 Blue Slip, the building will imminently stand 40 stories atop Greenpoint, on Brooklyn’s East River waterfront. 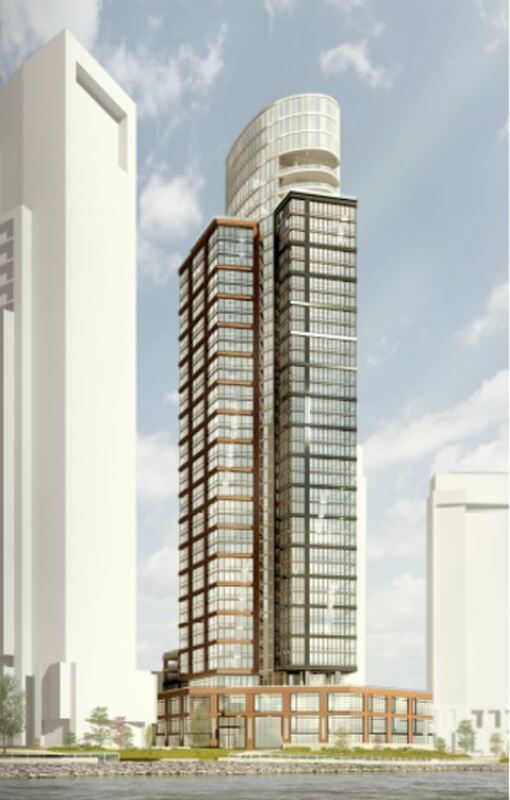 The project is being designed by Handel Architects and developed by both Brookfield Property Partners and Park Tower Group. L+M Development Partners is the third developer of Greenpoint Landing, but is not involved with this particular skyscraper. The site is located just off of Commercial Street behind 5 Blue Slip, and sits about a quarter mile to the north of The Greenpoint, aka 21 India Street. 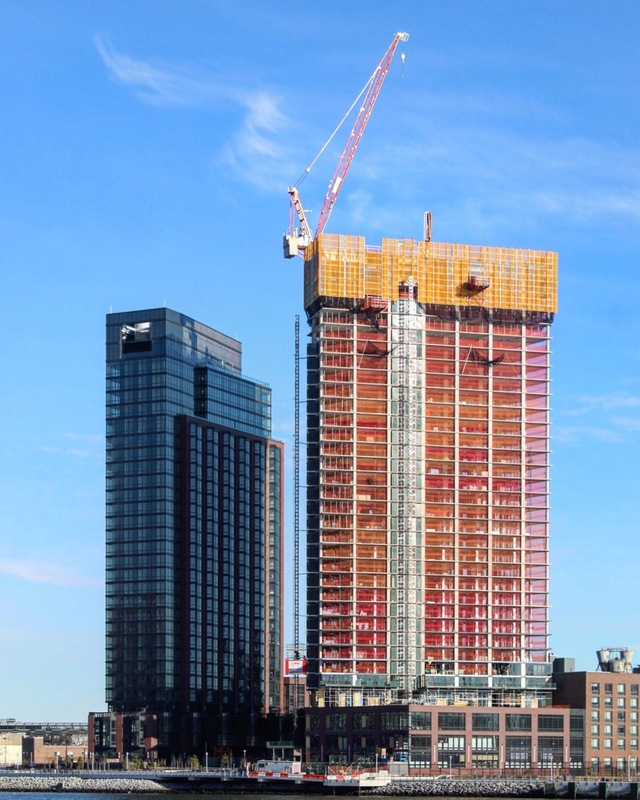 41 Blue Slip is being built next to 37 Blue Slip, which was the first tower to rise for the Greenpoint Landing masterplan. Both structures sit directly on the waterfront on the northern tip of Brooklyn. Newtown Creek separates the site from Hunters Point South and Long Island City to the north. A total of ten residential buildings will eventually be built at Greenpoint Landing, yielding a total of 5,500 residential units. 1,400 of those will be affordable. 41 Blue Slip will house just over 400 apartments. The structure has already surpassed the height of 37 Blue Slip, and should top-off quickly in the next couple of months. The facade is now beginning to rise on the first few floors, and will consist of a tight grid of glass, dark columns, and beams. An elliptical-shaped crown will sit on top of the building, clad with reflective curved glass. Thanks to the repetitive floor plans, the building is quickly rising to the final floors. Amenities for 41 Blue Slip include a fitness center, on-site parking, bicycle storage, and a rooftop terrace with uninterrupted and expansive panoramic views of the sunsets over Midtown and Lower Manhattan. Children can also play at Greenpoint Playground, located across Commercial Street to the south. A completion date has not been announced, but sometime by late 2019 or the first half of 2020 is likely. 14 Comments on "Greenpoint Landing Mega-Project’s 41 Blue Slip Approaches Topping-Out"
It certainly isn’t Shakespeare, but one usually gets the gist of what David is trying to say. His dependability is comforting in its own way. I strongly agree! And I think his comments are actually kind of better than Shakespeare, each one is a bit like a Haiku requiring some interpretation but almost always actually fairly accurate. YIMBY, you post new stories every day, unfailingly. Good for you! Looks like close to the major stepback on the most taller portion. And it was report before that tower what will sitting north of completed 30 story 37 Blue Slip, will be built soon as 31 story, 368′. So, this 40 story will be second completed tower in Greenpoint Landing, forming little skyline along with India Street 39 story tower. I remember just few years ago it was nothing above 5 floors in Greenpoint, what is/ or was polish immigrant neighborhood. Now in the center of huge development and gentrification. In perspective waterline Skyline from Astoria to Red Hook will be formed as unbroken BQ unique skyline with 30-40-50 stories towers accented it. Already have chunks of Queens West, Hunter Point North, Greenpoint, Williamsburg, Domino’s Factory redevelopment, Emerging Navy Yard with Dock(#?) Office building, Dumbo, Brooklyn Park Towers. In the nearest Future will be connected tigether with BQX streetcar or with busexpress (50/50 chance for either one). Btw, latter option is not bad, like in Cleveland Ohio or Las Vegas NV, they used nice busexpress lines looks like modern streetcar but on wheels!!! BDB must consider this as alternative to expensive BQX. And with fast growing needs of alternative transportation connection between Brooklyn and Queens. Very cheap to built, just articulated buses with specific paint, and bus islands, plus specifying bus only lines like selective bus service, except special separated fast lines, also exist as that in Pittsburgh and in Maimi-Florida City. Way cheaper than streetcar, and new electric long buses with efficiency greater than trolleys. Esspecially if Amazon HQ 2 project adds tens of thousands jobs and corresponding number of new apartments nearby. One distinct advantage of the BQX is that it would provide for a much faster direct route (via a new & shorter bridge) across Newtown Creek between Long Island City and Greenpoint –whereas the alternatives would need to rely on the much more convoluted & difficult route across the Pulaski bridge to the east, and it would need to deal with busy traffic-clogged McGuiness Blvd and environs. The subway extension to Hudson Yards was also expensive, but it paid off immensely in so many ways, as will an investment in a BQX link between north Brooklyn and western Queens. Transit is the lifeblood of this city and this economy. We need the transfusion of new ideas, new energy, and new approaches like the BQX if we are to continue to both survive and thrive. For many years NYC transit was obsessed with transporting people in and out of the holy grail of Manhattan, to the neglect of viable inter-borough connections. Nowadays many areas of Brooklyn & Queens have become vital centers of commerce, residence and entertainment in their own right, and NYC transit must address that expanding need with innovative transit connections like the BQX between these two boroughs. IMO every cent of BQX (v bus ) would be returned over and over in the years to come by strengthening all the communities from Astoria southward to Brooklyn. Neighborhoods in the vicinity of each BQX stop would be enhanced. Development around stops even could be prioritized. Rider eperience iin transportation increasingly is important and needs to be considered. Buses are generally depressing, claustrophobic, noisy, disruptive. If the growth of the East River waterfront is to continue (hello Amazon), we must invest in the correct, urbane infrastructure. I think it’s great all these architectural properties. The most important is all the people living in these buildings create communities with positive energy and transmit the same powerful positive energy to create a good vibrant relationship between the community. Let all these progress brings us like together. Communities you say? How wonderful! a concept benevolently imported by real estate developers. You sorely need to be informed that many of these immigrant communities like Greenpoint WERE ALREADY, and for many years in the past, vibrant & well maintained communities with lots of “positive energy & good vibrant relationships”. “hello, I like the place, it has potential – now get out”. Good decent hard-working ordinary people who played by the rules, who lived there all their lives and had deep community roots, were (and are) being forced out, so that these wealthier invaders can enjoy their views of Manhattan & their lattes. You call this “progress that brings us all together”. I beg to differ. For far too many, gentrification is a cruel malevolent death rather than a much touted re-birth. In too mant cases communities have not been founded. They have been destroyed. Any so-called affordable housing crumbs are worthless when compared to the destruction that rampant gentrification visits upon the rest of the neighborhood, the renters, the mom and pop stores, and the lives torn apart because of greed & class. What are we changing from, and how? What have we gained, and what have we lost? What are we changing to, and at what cost? And most importantly, who pays the price? rather than the real estate that surrounds them. a jungle where everything has a value, but no one is valued. Its going to be a total mess for commuttees, there is only one way in and one way out of that area of greenpoint. The G is lomited, uber cars are going to be completely clogged up, over crowded buses and all the trash trucks are going to make it a place hard to commute from. Oh there is the ferry I guess. The ferry ……which has no free transfer to transit. or when the waterways are clogged with ice. label for those new yuppie commuters. into Manhattan, for both work & pleasure. aptly called the Manhattan Avenue bridge. The G is not running at full capacity and the city is starting to more aggressively prioritize buses.